First Impression: Covington is difficult to box – on the one hand, it is a blue collar neighborhood with tattoo parlors and biker bars, and on the other hand, it is the home of the classy Northern Kentucky Convention Center and The Ascent condominium, which sells units for millions. The city boasts a little bit of everything – excellent dining, active night life, arts and culture, unique independent shops, and both a healthy business district and diverse residential neighborhoods. All of Covington’s offerings come with a strong dose of personality. Second Look: Covington, incorporated in 1815, is the place where waters converge - both literally, at the confluence of the Ohio and Licking rivers, and figuratively, with the merging of diverse cross-currents of culture, industry and lifestyles. It is the largest city in Northern Kentucky, with a population of about 43,370 spread over 13.7 square miles. 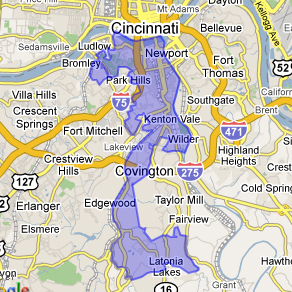 The key to Covington is contrast. It is home to two Fortune 500 companies, as well as numerous mom and pop businesses, consignment stores and pawn shops. It boasts a couple of gorgeous cathedrals with a devout following, but also a thriving entertainment district that runs the gamut from cocktail lounges to seedy dives. Covington is known as a blue collar, working class neighborhood (and sports a surprising number of liquor stores per capita), but also nurtures an artistic sensibility, with a growing arts district, monthly gallery hops and financial incentives for artist home-buyers. The historic district is second only to Louisville for number of buildings on the National Historic Registry, but is also developing stunning contemporary living spaces, such as The Ascent condominium, which contains suites that sell for millions of dollars. Covington's dual personality (and sense of ironic humor) is clearly portrayed in its two main strips, which run parallel to each other, separated by only a couple of blocks - the main street (affectionately called Mainstrasse in honor of its German roots) and Madison Avenue - the bridal district, complete with Wedding Mall, a reception area and bridal boutiques. Mainstrasse, a popular date zone, is where couples meet and court one another - and up the street on Madison Avenue is where they prepare to tie the knot. Weddings and receptions are commonly held in nearby Devou Park - one can complete the entire process within a three-mile radius! Covington is a treasure trove for the urban adventurer, offering just about anything curiosity desires - from art oddities housed in a rehabbed church to puppy vogue items at the doggie boutique. Tattoo parlors, stained glass studios, vintage clothing stores, hair salons, florists and a new age center are among the many businesses that make Covington a great place to find a last-minute gift or window shop for hours. It's eminently walkable, and also only a half hour journey on foot to neighboring Newport or Downtown Cincinnati, and easily accessible by bus. Also, unless one intends to spend, Covington is an area friendly to visitors on a budget - all of the eye candy makes for good, cheap fun, as do the abundant recreational areas on 6th Street, Covington Landing and Devou Park. Covington is a jumble of specialty shops, both upscale and casual eateries, art galleries and plentiful watering holes, laid out in what appears at times a seemingly random fashion - asymmetrical intersections and one-way streets frustrate outsiders but endear residents to a neighborhood that is best explored on foot. Full of narrow alleyways and hidden corners, Covington is like the site of a giant scavenger hunt - you never know what you may find, but are sure to be rewarded if you look.